For those unfamiliar—and I find this idea hard to believe—Funyuns are fried onion rings in snack form. Introduced in 1969 by Frito-Lay, Funyuns are a salty and vaguely tangy treat that I have a long history with and an special fondness for. And given the holiday season, it’s a perfectly acceptable substitute for fried onion topping—in fact, I prefer Funyuns. It has just a light-enough crumbly structure that makes it versatile for a gratin topping, crumbled atop tacos, as a Shake ’N Bake-style exterior for poultry. And if you don’t use it all, simple solution: you just eat the rest straight from the bag. I remember the first time I tasted the crunchy chips: I was 9 years old and my older sister’s friend had brought them to a gathering at our house. I was not invited to join in on the fun that these high school seniors were having, but as any good little sister would, I spent the entire night spying on the shenanigans. I ended up eating the chips out of retaliation after overhearing some jock named Matt making fun of my new pixie cut, saying I looked like a boy. The sensation of experiencing something entirely unlike any chip I had eaten before was enough to instantly help me move past my hurt feelings. Besides, even as a third-grader, I could tell Matt was the type of guy who peaks in high school. Funyuns remained a comfort food into my adulthood. When I stopped going home for the holidays and started making my own Thanksgiving dinner, I quickly incorporated Funyuns in the mix. It started out small with a tiny tweak to my green bean casserole. Instead of using 1 1/3 cup of French’s French Fried Onions as the Campbell’s recipe instructed, I employed an entire bag of Funyuns making for a similar but tangier side dish. Why stop there, though? 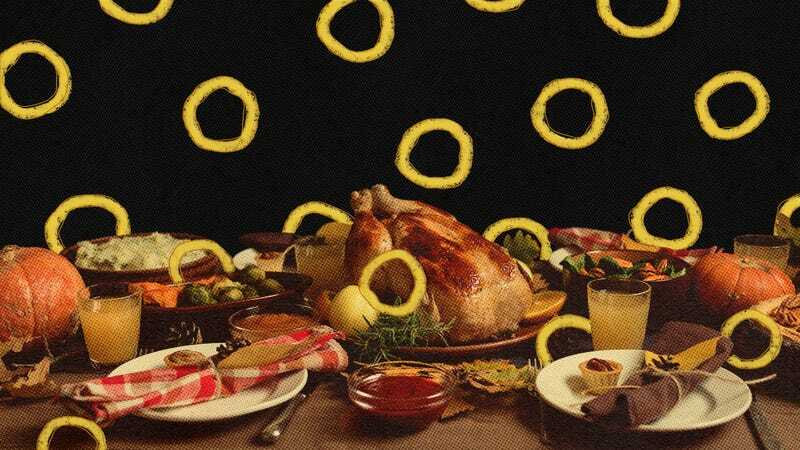 Let’s talk about how four courses of Thanksgiving can include four opportunities for Funyuns to have fun! My first attempt at upping the snack onion ring ante was not a large departure from green bean casserole, but it did make a difference by taking a Thanksgiving staple from an easy-to-forget-about sides to a memorable appetizer. Note: You do need a green bean casserole recipe on hand—so consider this more a method to amp up a pre-existing dish. Preheat oven to 400 degrees Fahrenheit. Lightly grease a baking sheet or line it with parchment paper. Combine green bean casserole, Funyuns, and cheddar cheese in a medium bowl. Spoon mixture into mushroom caps. If desired, sprinkle a few more Funyuns on top. Bake for 20 minutes. I grew up hating yams at Thanksgiving. Yams with marshmallows? Even worse. But yams with Funyuns? That I can get behind. This is also a great recipe to introduce you to the pulverized Funyuns, which will come in handy for making the main course. Place Funyuns in a food processor and pulse until crushed. You can also add them to a zip-top bag and roll with a rolling pin until the rings are completely crushed. Toss sweet potatoes in oil and salt until well coated. Line a baking sheet well with aluminum foil. Lay sweet potato strips out on a baking sheet with no overlap and then lay a narrow line of brown sugar along the center of each. Combine the smoked paprika and pulverized Funyuns, and dust the potatoes liberally. Drizzle a small amount of syrup across all of the assembled sweet potatoes. Bake at 350 degrees Fahrenheit for 30–45 minutes, checking occasionally. The potatoes should blacken slightly as the sugars caramelize, but feel free to flip them over midway if you want them to remain char-less. When you stick a knife into one with no resistance, it’s done. This is less about sneaking Funyuns in and more about giving them the spotlight they deserve. Much like the Flamin’ Hot Cheetos-crusted turkey previously shared on The Takeout, this recipe comes courtesy an aluminum foil company. Follow the link for a step-by-step recipe, but essentially, you crush a bag of Funyuns, brush the turkey with melted butter, then coat the exterior of the bird with the crushed onion rings. You roast the turkey as usual. I’m not going to pretend to have anything more than a working knowledge of wine, but I like to think of this combination as the fun answer to strawberries and champagne. So instead of Richard Gere explaining how strawberries bring out the taste of the champagne to Julia Roberts, this is just me letting you know that one can never fail with a sweet and salty combination. I’ve spent many a holiday season Funyuns and a nice glass of Riesling while binge-watching everything from 666 Park Avenue to Penny Dreadful.